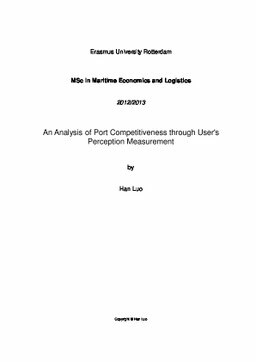 The purpose of this research is to explore and distinguish the importance of relative factors which determine ports competitiveness from ports users’ perspective. Port users were defined into three groups, that is, shipping liners, freight forwarders and shippers, and they will be investigated in this study. The results regarding to the importance of various factors relied on the questionnaire from professionals and staffs in this industry based on their different angles by using AHP (Analytic Hierarchy Process) model. Then, the results of survey were used for measuring European Top 4 ports, port of Rotterdam, Hamburg, Antwerp and Bremerhaven were listed to be considered as the target ports. The potential influential factors are geographical location, physical infrastructure, hinterland connection, technological infrastructure, port management and administration and terminal cost. The importance of these factors are various from different users’ requirements and expectations on port services. Hinterland connection is a common focus of all parties’ concerns, port efficiency and infrastructure construction are still the main targets that ports are struggling for and the exploration and usage of information technology is beneficial for improving operational efficiency of ports to some extent. Conclusions finally were drawn based on the analysis which can be used as benchmark to measure ports performance and their competitors as well, in order to realize which aspects should be put much attention for further improvement.